TL R - What could this grease be that smells like metallic crayons and comes in airsoft guns. It's amber/brown, melts under heat without smoking, and has a NLGI grade over 2 (Though NLGI 1-2 would be better for this applicaton). Two calls to airsoft gun maker's tech support both said White Lithium, but this doesnt' look like any White Lithium I've seen unless this is old or has a different base. Two companies said White Lithium, but no information on base oil. Grease melts under a torch and doesn't really smoke. Has a 'Crayon' scent to it. 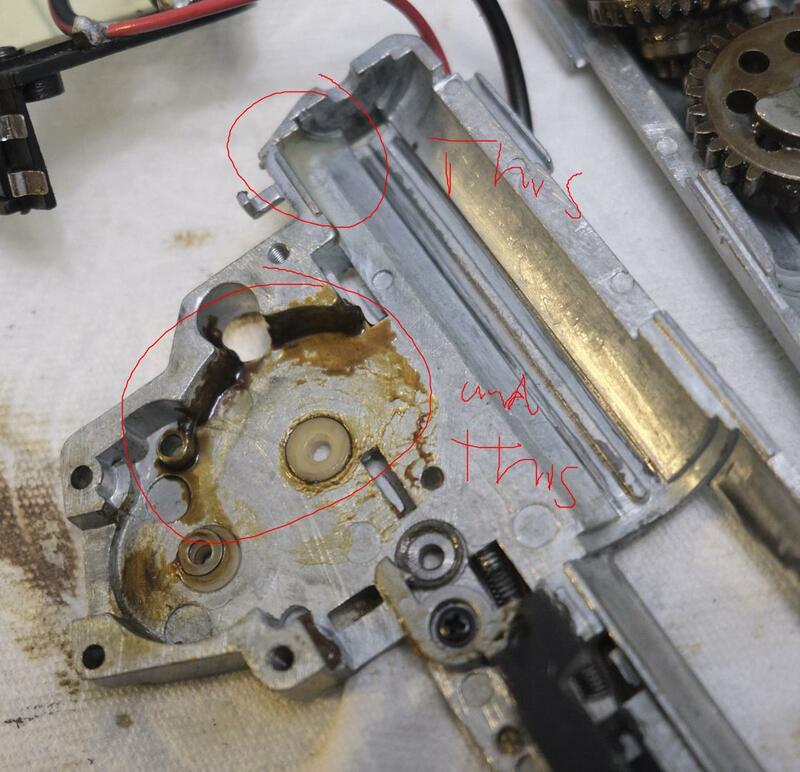 So for the last couple weeks I've been trying to identify the grease that airsoft guns come with from the factory. I'm doing this because forums and community groups always say to replace the 'awful' factory grease and replace with something else, but when I press people on it it turns out they don't seem to actually know what the grease IS! I've been trying to identify the grease on the smell, which I can describe as metallic and waxy like crayons. Cosmoline is also described as having a crayon odor, but for how cheap lithium greases are I can't imagine they'd use Cosmoline as a lubricant. There's also slight differences between airsoft gun brands' greases, but all have the metallic crayon smell. Currently, I'm trying to study, what I believe are, mineral-oil based greases as the synthetic greases I've tried have very strong petroleum odors, unlike this grease. Kyodo Citrax EP1 was one of the greases I was looking at, it's a mineral oil/lithium grease with a similar color, but I can actually smell it without ordering a big tube of it. I've also found that the grease in our Kitchenaid Mixer had a similar metallic/crayon odor, and the OEM grease should be Benalene 930-2, which is a Mineral oil/Silica food grade grease. -Has a metallic/crayon smell without any noticeable traces of petroleum/kerosene odor. -Fairly thick at room temp. It's sticky, but may just be old grease. I'd guess it's NLGI 3 by now, NLGI 1 or 2 would work better. I've tried a couple different greases with synthetic bases, specifically Chevyron Ulti-Plex Synthetic and Mag1 Multi-purpose Lithium, both which have the very strong petroleum/kerosene odor. Since the gearboxes are usually about an inch or two from a player's face, I'm assuming the manufacturer's avoid the better synthetic greases due to it making the guns smell like an oil refinery. Any information or direction would be greatly appreciated!